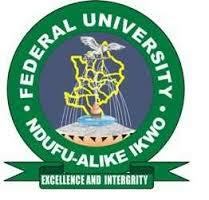 Alex Ekwueme Federal University, Ndufu-Alike (AE-FUNAI), Ebonyi State Centre for Educational Services (AE-FUNAI CES) Pre-Degree Admission Form, Duration, Eligibility, Courses, Application Guidelines for 2018/2019 Academic Session. Latest Update: Submission of online forms will now close on 31st October, 2018 at 11.59 pm. Applications are invited from suitably qualified candidates into the AE-FUNAI Centre for Educational Services (AE-FUNAI CES) for admission into a non-resident Pre-Degree programmes of the Alex Ekwueme Federal University, Ndufu-Alike (AE-FUNAI), Ebonyi State. More information on subject combinations for the Pre-Degree programmes can be found on our ePortal (http://www.ces.funai.edu.ng/programmes). Ten thousand Naira (N10, 000. 00) only.